Why experience one chic island resort, when you can indulge in two? on the neighboring islands of St. Martin and Anguilla. 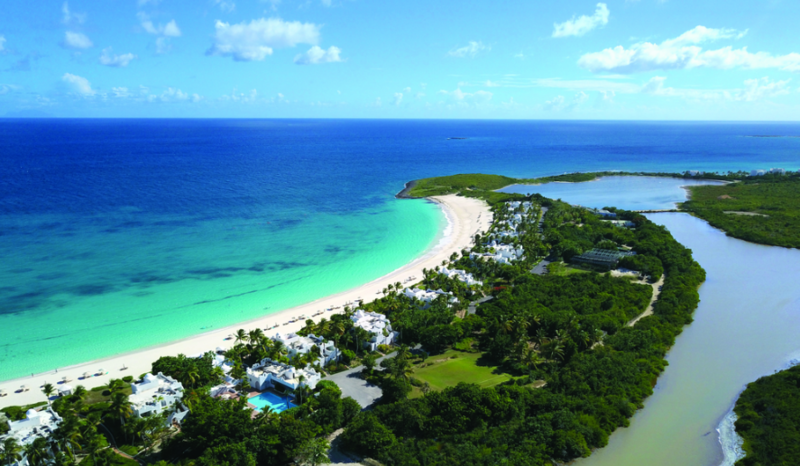 Cap Juluca has been restored to its legendary status as one of the Caribbean's ultimate resorts for those in the know. 'CAP's Cool Pool': a show-stopping sea view infinity-edge pool and new outdoor terrace with a shaded botanical courtyard and spacious tree-lined sunbathing decks. Dine and socialize by the pool while taking in the mesmerizing views of the beach. ‘Disappearing Spa’: Nestled in tropical landscaped gardens and perched on top of the resort's private headland, the 'Disappearing Spa' Majestically perched on the property’s private headland and offers panoramic views of crystal blue waters while you exercise, relax and unwind, in the yoga pavilion, gym or all-suite treatment villas. Signature spa treatments featured locally harvested Anguillan salt that complements the healing powers of the sea. Local Gastronomy: From the barefoot luxury of the rustic beach bar 'The Cap Shack' with its rum punches, catch of the day, and BBQ beach tapas served to the rhythms of Calypso music, to the relaxed fine dining of Pimms, to the juices and light bites of the Maundays Lounge and Pool Terrace, Belmond Cap Juluca is at the heart of Anguilla's culinary scene, championing locally sourced seafood and local recipes. Laid-Back Local Life and Modern Elegance: Spread across Belmond Cap Juluca’s secluded crescent-shaped cove and located just steps from the white sandy shores are 113 newly appointed guest rooms and suites – all with large private verandas or balconies. The interiors honour laid-back island life with private indoor/outdoor seating, many with bathrooms that overlook walled botanical courtyards. Friends and families will enjoy the 3 and 5-bedroom island living private villas with luxurious kitchen, dining areas and private pools. Colorful botanicals and indigenous plants seamlessly blend the tropical environment with the new design… all on one of the best beaches in the Caribbean. This fixture in the prestigious culinary capital of the island, Belmond La Samanna overlooks Baie Longue's mile-long, white sand beach. Belmond La Samanna is back on the scene in St. Martin, with a chic restyle to heighten your enjoyment of this famous European-island neighborhood. French Romance and Caribbean Chic: The resort's new art direction plays with 'pastel-chic' and botanicals inspired by the natural colors of the Caribbean, all through the lens of a romantic French escape. The resort's rooms and public spaces including the re-imagined Baie Longue Bar, Trellis restaurant, and main building, maintain their sense of place with European flare. Culinary Excellence: Located in the heart of this prestigious French West Indies neighborhood and culinary capital of the Caribbean with over 400 restaurants, Belmond La Samanna contributes to its culinary reputation with French restaurant Trellis, La Cave Wine Cellar, the largest private wine cellar in the Caribbean, which offers memorable fine dining with wine pairing experiences, and even the Beach Bar, a glamorous, water's-edge nightspot for a sunset champagne or custom cocktail while relaxing on lounges or playful swings. The Beach and Beyond: Baie Longue is not just the setting for gastronomy; by day, the Water Sports Cabana is your destination for water skiing, kayaking, sailing, paddle boarding, snorkeling and scuba off nearby reefs. A tennis pro livens up cool mornings, the hilltop La Samanna Spa provides locally-inspired treatments, and the nearby French St. Martin capital town of Marigot has a colorful market and designer boutiques. Belmond La Samanna offers the best of both worlds - a stylish private beach and spa oasis that embodies the island’s classic French spirit. 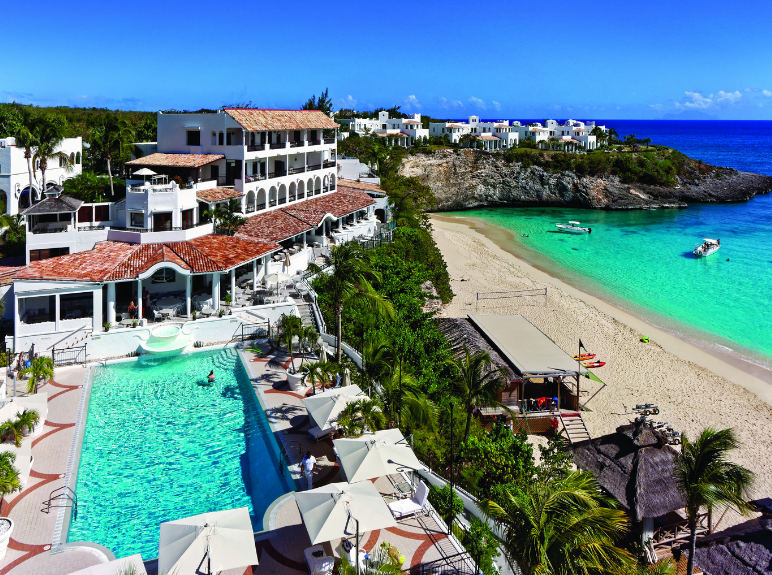 And you don't have to choose between these two inspiring, and very different Caribbean resorts, when you choose the island-hopping package that includes both of these prestigious Belmond properties. Belmond is a global collection of exceptional hotel and luxury travel adventures in some of the world’s most inspiring and enriching destinations. Established almost 40 years ago with the acquisition of Belmond Hotel Cipriani in Venice, the Company owns and operates 46 unique and distinctive hotel, rail and river cruise experiences in many of the world’s most celebrated destinations. From city landmarks to intimate resorts, the collection includes Belmond Grand Hotel Europe, St. Petersburg; Belmond Copacabana Palace, Rio de Janeiro; Belmond Maroma Resort & Spa, Riviera Maya; and Belmond El Encanto, Santa Barbara. Belmond also encompasses safaris, six luxury tourist trains including the Venice Simplon-Orient-Express, three river cruises and ‘21’, one of New York’s most storied restaurants. Terms and Conditions Include: Prices in USD; starting from $3500 in low season, including transfers and $200 per resort credit, subject to availability, excluding taxes and resort fees.